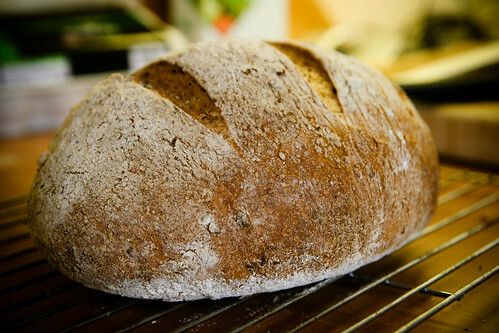 I’ve written about this recipe before (see Malted Grain Loaf: best loaf ever?) but thought it was worth another moment in the spotlight after a recent success adapting it to use Shipton Mill’s new Seeded White Flour. I made this bread for my Airbnb guests last weekend, who arrived just as the bread was coming out of the oven (my most recent prototypical Country Living moment). I served this bread as part of my Airbnb “complimentary help-yourself breakfast”, along with butter, jam, muesli, milk, fresh fruit, coffee and tea. I am always fascinated by what my guests choose to eat for breakfast, and for these folks, breakfast seemed to consist of nearly an entire loaf of bread, Keens cheddar and marrow chutney. And they had the same breakfast for the remainder of their three-night stay. I needed to make more bread! What I love about this recipe is that it works really well for free-form loaves (vs tin loaves). It is also a yeasted bread so I can make a loaf within a few hours, making it a good contender for morning baking and lunchtime eating. This particular recipe seems well suited for heartier flours (the original uses malted grain flour, and the Shipton Mill’s seeded white flour is full of, well, seeds – sunflower, linseed, millet, poppy and pumpkin seeds). The dough is denser than the no knead bread I’m used to, but I suppose that’s why it works for free form baking. 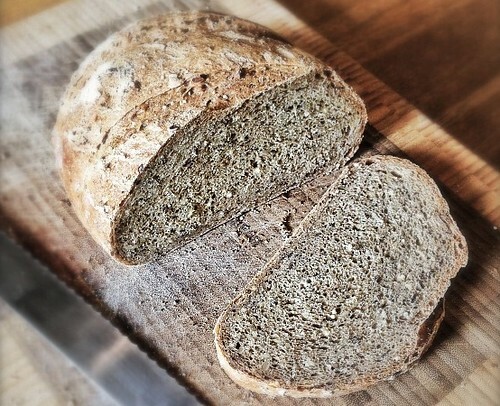 Adapted from the River Cottage’s [url href=”http://www.channel4.com/4food/recipes/chefs/hugh-fearnley-whittingstall/malted-grain-loaf-recipe” target=”_blank”]malted grain loaf[/url] recipe. Combine the flour, yeast and salt in a large mixing bowl. Add the water and mix to a rough dough (I recommend using your hands). Add the butter or oil and mix well. Adjust the consistency if you need to with a little more flour or water to make a soft, easily kneadable, sticky dough. Deflate (‘knock back’) the dough by tipping it on to the work surface and pressing all over with your fingertips. Then shape the dough into a loaf, dusting it with a little rye flour if you have some. Transfer to a well-floured board, linen cloth or proving basket, lay a plastic bag over it and leave to prove, until almost doubled in size again. Transfer the loaf to the hot tray, removed from the oven. Slash the top, if you wish, with a serrated knife. Put the loaf into the hot oven and give a few squirts from the spray bottle over and around it before closing the door as quickly as you can. Bake for 10 minutes, then reduce the heat to 200°C/gas 6 and continue baking until well browned and hollow-sounding when tapped – around 30 minutes. That bread is perfection. I wish I could do half as well. My bread tastes good but it’s never that beautiful. 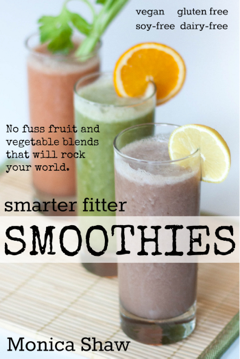 Am going to try this now and see if it looks as good as yours!